If you’re still searching for the most reliable authentic pad Thai recipe, stop here because Thai chefs from street food stall make this. And, when I’ve discovered the formula from a Pad Thai chef in Bangkok neighborhood, it’s ridiculously simple! 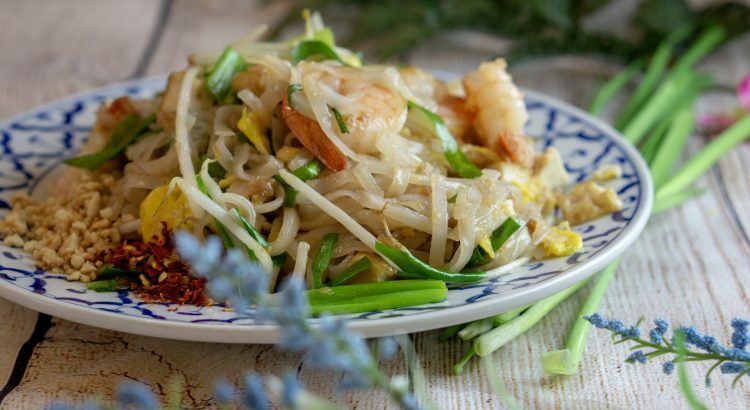 Since I moved away from my hometown, I found out there is tons of Pad Thai recipes, and most Thai restaurants outside Thailand adapted the ingredients to meet customer preference. The essential element in real Pad Thai is “dried shrimps” which makes a unique flavor and most recipes try to skip. But, this is the secret ingredient! If you have ever been to Thailand, you might know that you have to go to specific food vendors or specialty shophouse. 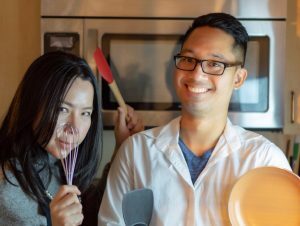 On the other hand, Some restaurants or recipes on the internet add tomato sauce, peanut sauce or even invent a new formula but they still write on the menu as authentic Pad Thai recipe. I figure out that people have a wild imagination to create a fusion pasta and Thai noodle, and I like that! Add sugar, tamarind paste, fish sauce, and vinegar. Mix them well. When it comes to stir-frying, I recommend you gather tools, sauces, ingredients ready to reach. It happened to me when I burned things while seeking them. Pad Thai noodle that I’m using here is from local Asian market and it’s FRESH (stored in the refrigerator). If you wish to use dry or dehydrated noodle sticks you can too by soaking for about 40 minutes. Add fresh water shrimps, and turn them on both sides. While stir-frying, you add a splash of water. After the noodle has sipped the sauce, add bean sprouts, chives, and diced fried tofu. After bean sprouts partially cooked, chives are wilted, transfer to your plate. Hurry up! You can’t wait too long to enjoy this. Pad Thai is best a few minutes after you’ve finished cooking. Crushed Peanut – I bought a jar of unsalted roast peanut, and grind it in a food processor. Chili Flakes – easy to find at a grocery store. Chive stalks or Green onion stalks – To fresh your mouth, try to bite it while enjoying the meal. Extra sugar – you might wonder if you need more sweetness. No, you don’t, but every time I have Pad Thai at local street food I always find a Tbsp of sugar on a side although I never use it, funny. there is a lot of Pad Thai recipe out there which might confuse you with a real authentic Pad Thai recipe. But they are still amazing Pad Thais! However, if you want to make it original, you can start now with recipe card below, and I wish it’ll meet your favor. If you have tried the recipe, please comment how you like it and send me photos! 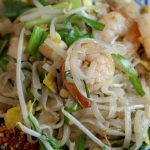 Quick and easy authentic shrimp Pad Thai you can find everywhere in Thailand but not outside Thailand. If you like real Thai street food, the recipe will bring you to the heart of Bangkok's food stall right into your home. Pound dried shrimps and pickled radish. Keep saute until bean sprouts partially cooked, chives are wilted, transfer to your plate. To garnish, place 1 Tbsp of the crushed peanut, dry chili flakes, sugar and a piece of lime wedges on a side. You can substitute any kinds of meats with shrimp such as chicken, pork, beef, seafood. I recommend to make a large batch of Pad Thai sauce at once and keep it refrigerated, so you can use it anytime you want.